Back at IFA last month, Huawei surprised the world by beating Apple to the punch with Force Touch pressure-sensitive technology on its phones… and then not doing much with it. One thing it could do, however, was weigh oranges. Here at FlexMonkey Towers, the ever beautiful Mrs FlexMonkey and I love to spend our Sunday mornings luxuriating in bed drinking Mimosas, listening to The Archers omnibus and eating some lovely plums. Being a generous sort of chap, whenever I pull a pair of plums from the freshly delivered Fortnum & Mason’s hamper, I always try to ensure she has the larger of the two. However, this isn’t always easy, especially after the third of fourth breakfast cocktail. 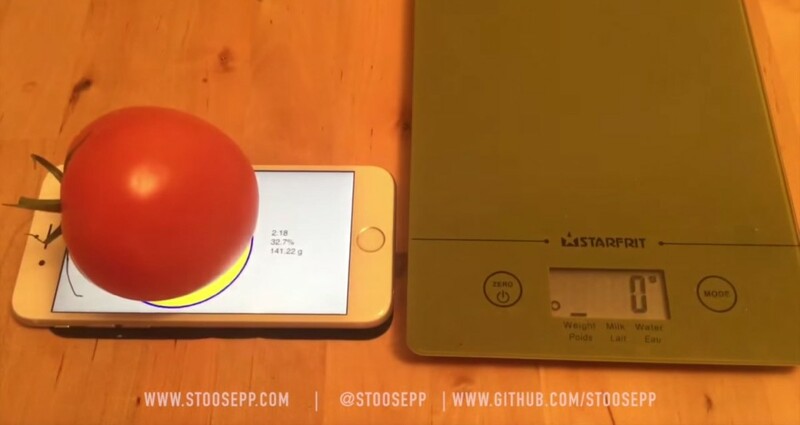 In both cases, the iPhone measured slightly different numbers depending on where the fruit was placed, so don’t expect it to replace your fancy kitchen scale yet – though it’s possible someone could refine the code later to account for variances across the display. Importantly, the pressure sensitivity only seems to work with soft-skinned fruits and vegetables, as it could not detect a potato. French fry fans will be disappointed. Still, the question remains whether the iPhone 6S can actually weigh oranges or, better yet, apples. And why are we even weighing stuff on our phones? These are mysteries I’ll leave for enterprising developers to answer. If you’re one of those, you can check out the source code for the Plum-O-Meter over on GitHub, and Stoo Sepp’s modifications here.